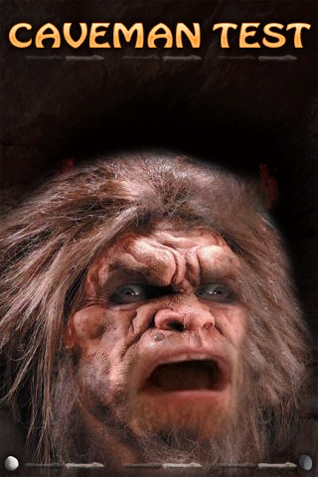 Caveman Test iPhone App Review. The two geniuses behind Str8ts and 1 to 25 have already set the bar very high for the iPhone puzzle game industry. It was kind of unexpected to see that they would be the ones to raise it even higher with another neat puzzle for your mobile delight. The game is called Caveman Test and I would dare say it raises new expectations from future puzzles that would be published in the AppStore in the year to come. Caveman Test, while not an original concept, stands as the innovative brother of "Sticks and Stones." This age-old game, prehistoric one might say, appears to be what cavemen where playing after a long day hunting. All they needed was sticks and stones, and of course a clever mind. Cave paintings and wear marks tend to confirm that theory that these homo sapiens were the first puzzle inventors, while the rest is history. Or so the story goes. 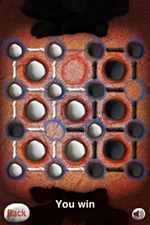 What can be confirmed though is that Caveman Test brings to your iPhone a neat puzzle game that you're bound to enjoy. 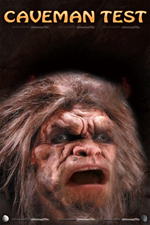 In Caveman Test you play against Ufkah the cave dweller and you have to beat him at his own game. The rules of the game are simple. Beating Ufkah is anything but. You play with the white pieces, Ufkah has the black ones. 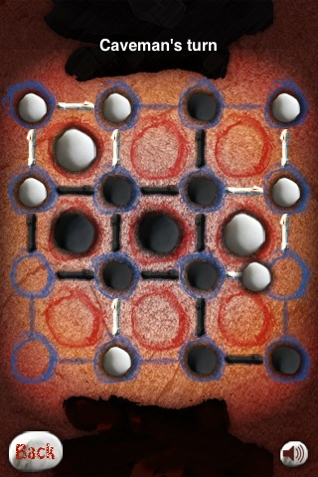 Your objective is to be the first of the two to place five of your large white stones on the ground and defeat Ufkah. On a board of 9 squares, you have 16 intersecting corners you can place a smaller white rock. You take alternative turns, with you being the first to place a stone (it's my personal opinion that's your first disadvantage, since Ufkah can react easily). The first turn consists of both you and Ufkah placing just one stone on the board. The next turn you have to take two moves. One move is your regular place-a-stone move. 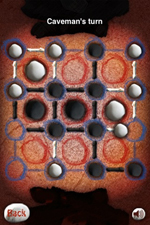 The second move is a push move, and what this basically means is pushing one of your own stones to move towards Ufkah's causing a chain reaction with each stone pushing the next one until the last stone either lands in the next free spot or (ideally) gets knocked off the board (again, ideally his stone). Having two stones next to each other, you get to place a stick of the same color between them, and when all four sticks are placed around the same square, you get ownership of that square (the big white stone). The first of the two to own five stones, wins. Controls are really simple with Caveman Test. It's just a matter of tapping to place a stone where you desire and swiping in a direction to push a stone. The game doesn't offer too many options for configuration of controls or graphics. The only thing you can turn on or off is the sound effects of Ufkah breathing down your neck and the sound of the stones spinning on the board. There's no real need for more config options, since you're here to play a puzzle game. The whole focus is on the game itself, without the bells and whistles you'd find with other AppStore games. This is where Caveman Test really excels. Being a puzzle game, I wouldn't have expected slick graphics and maybe not even a theme. But everything from the fonts used to the cave-like backdrop and the stones and the animations are a clear re-enactment of a game that takes place inside a cave. Ufkah's breathing is also playing an important part in this theme, and even if you're not really paying attention to the graphics and sound effects, they are there and they really work within the game itself. One addition is the victory tablet at the end of the game. If you happen to win, you'll be able to engrave your victory on a stone tablet that acts as a leaderboard score. You definitely have one difficult game on your hands. And with such a difficult game, I would have expected more bragging rights for when I do beat the savage. Things like tweeting my score, posting on facebook or simply sending via email to a friend would certainly be appreciated. Again, the game really pits you against the best of the best, and you'll need a bit of luck to see into the future and plan your moves in order to beat Ufkah. I've managed to do it 5 times (out of about 20-some games) which is an incredibly low win-lose rate, but I'd have really like to brag those 5 times. Wouldn't you? Thanks to the guys over at Syndicated Puzzles, who have made this great game happen! They've been kind enough to give us 20 promo codes to give out to 20 winners of a contest Appbite designed in co-operation with Syndicated Puzzles! The idea behind the contest is simple. Find Ufkah's third eye in the picture, submit your answer and win your free promo code! More details available on the contest page! So what are you waiting for? Head over to the contest page and win that promo code!!! What do you think of Caveman Test ? scroll down for our comment section.